Following hip replacement surgery, Rhode Island senior home care providers can expect their elderly loved one to spend anywhere from three to five days in the hospital. During this time, they will receive pain management, incision care instructions and physical therapy. Once released, full recovery occurs in approximately three to six months. 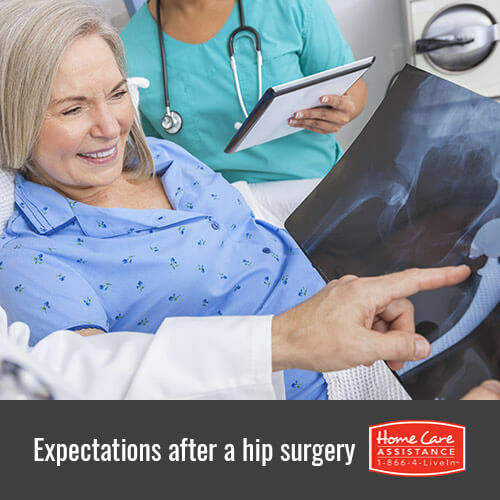 When at home, there are different things you need to expect while he or she recovers. Whether recovering at home or in a long-term care facility, make it easy on the older adult by creating a recovery station. This area should include frequently used items placed in such a way that they are easy to reach. These items might include a TV remote, tissues, a radio, telephone, medications and fluids of choice. Remove obstacles from frequent paths in order to reduce the risk of falls. In order to heal properly and prevent the implement from dislodging, certain activities and movements are prohibited. Seniors should never assume a physical position that requires extreme flexion of the hip joint beyond a 45-degree angle. Walking is usually advised as tolerable. Going up and down the stairs and running are typically forbidden. Dealing with the first week or weeks of pain often requires management using prescription medications. Elderly adults may experience frustration, depression or anger at having to endure the discomfort and physical limitations. Caregivers can be most helpful by offering compassion, understanding and support. Assure your loved one that this setback is merely temporary and lasts only a few months. In order for recovering seniors to remain positive during the healing process, they need to be surrounded by loved ones or caregivers who display compassion and patience but who also are willing to be stern when necessary. Ensure that seniors do not overexert themselves. But make sure they perform exercises as recommended and keep follow-up appointments with physicians or therapists. If you’re short handed or need someone to be with your loved one during recovery, Home Care Assistance of Rhode Island can help. Although we provide specialized services such as stroke, Alzheimer’s, and dementia home care in Rhode Island, we also strive to help clients recover from injury and surgery in the comfort of home. Our compassionate caregivers will assist your loved one with everything from mobility training to personal care. Call (401) 284-0979 today and schedule a free consultation with an experienced Care Manager.